SportsAid has announced the ten athletes on the shortlist for this year’s One-to-Watch Award. The annual award, set to be presented at the charity’s SportsBall in London on Thursday 23 November, was launched in 2006 and looks to shine a spotlight on the achievements of Britain’s brightest young sporting prospects. Among the shortlist of ten are two young and aspiring rowers; Holly Dunford and Calvin Tarczy (see previous article). 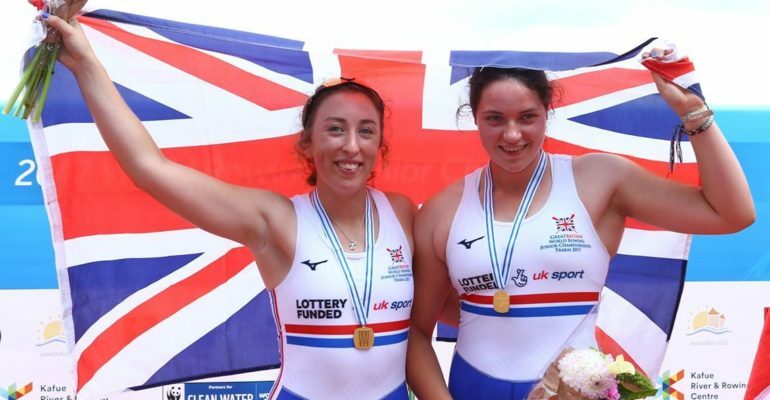 18-year-old Holly Dunford, who is a pupil at Heathside School in Weybridge, claimed gold in the women’s double sculls at the World Junior Rowing Championships in August. She and partner Zoe Adamson edged Germany in a thrilling race, winning by just over a second, at the championships in Trakai, Lithuania. The victory, Dunford said, was a moment she will cherish forever and a huge boost as the Molesey Boat Club rower aims to establish herself as a senior athlete. Dunford, who benefits from receiving financial assistance from SportsAid, is now in line to join such illustrious company as one of ten nominees selected from over 1,000 rising British stars supported by SportsAid across more than 60 different sports. Dunford and Tarczy are joined on the shortlist by eight other athletes from seven different sports: Beth Shriever, 18, from Braintree – cycling; Caroline Dubois, 16, from Chelsea – boxing; Charlie Smith, 18, from Leighton Buzzard – canoeing; Craig Boardman, 17 from Thruxton – Para-athletics; Finette Agyapong, 20, from Newham – athletics; Kate Waugh, 18, from Gateshead – triathlon ; Lauren Hemp, 17, from North Walsham – football; and Lily May Humphreys, 15, from Sudbury – golf. SportsAid’s One-to-Watch Award was launched in 2006 with double Olympic medallist Tom Daley the inaugural winner. In addition to Daley, five of the other previous recipients of the award represented Great Britain across the Rio Olympic and Paralympic Games in 2016. Dame Katherine Grainger, Britain’s most decorated female Olympian, and five-time Paralympic champion Natasha Baker are among the panel of judges for the award. The winner of SportsAid’s prestigious One-to-Watch Award will be revealed at the charity’s annual SportsBall in London on Thursday, 23 November. All the funds raised from the SportsBall help to support the next generation of British athletes. Please visit www.sportsball.org.uk for ticket information.